The Samsung Galaxy Note 8.0 was unveiled by Samsung at the weekend just prior to MWC 2013 kicking off in Barcelona. This tablet is rather different from some as it gives the user the ability to make phone calls although we’re pretty sure we’d feel a bit conspicuous lifting an 8-inch tablet to our ear to do so. The Galaxy Note 8.0 is set for release in Q2 and we’ve just seen a glimpse of one of the first official accessories for it, a car dock that’s a real big’un. Obviously a car dock for an 8-inch tablet/phone hybrid is going to be pretty sizeable and let’s face it, you may well be spending plenty of time hiding in your car if you’re about to make a call using it, rather than walking brazenly down the street. Seriously though, we’d expect this Galaxy Note 8.0 car dock will actually be quite useful and as it’s an official Samsung accessory you know it will be fit for the job. 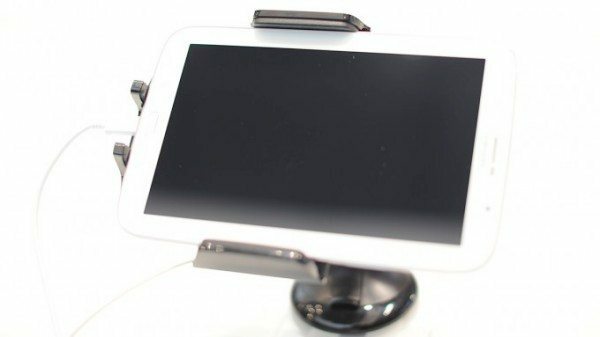 The Galaxy Note 8.0 car dock is made from black shiny plastic and actually looks as stylish as anything made from black shiny plastic can do. However, as our source below points out, you may be sometime finding a suitable position to place the dock so that you don’t give yourself a gigantic blind spot when driving. If you can get past that though there’s no doubt that this accessory will sell in plentiful numbers. No news yet on pricing or availability from Samsung but we’d expect it to arrive around the time of the anticipated Q2 tablet release. For more on the tablet specs head here. We’d like to hear your thoughts on the Galaxy Note 8.0 official car dock? Will you be purchasing the Note 8.0 and if so will the car dock also be on your shopping list? Let us know by sending in your comments.